Torrance Tests of Creative Thinkking – Scholastic Testing Service, Inc.
Scholastic Testing Service is the publisher of the highly reliable Torrance® Tests of Creative Thinking (TTCT). For many years, the TTCT has supported educators with identification of gifted and talented students and have been used as part of gifted matrices in states and districts in multicultural populations for more than 50 years. The TTCT assesses creative abilities and provides students an opportunity to demonstrate their diverse talents, imagination, and creative potential based upon life experiences. 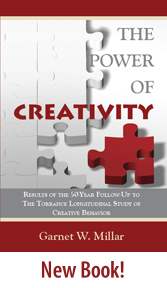 It has also been found to predict children’s creative achievement better than most IQ tests. The TTCT invites examinees to draw and give a title to their drawings (pictures) or to write questions, reasons, consequences and different uses for objects (words). Published in two equivalent forms, Forms A & B, the Figural and Verbal TTCT can be used for pre- and post-testing. The Figural TTCT is also available in Spanish. The Figural TTCT is appropriate for kindergarten through adult with an administration time of 30 minutes. The Verbal TTCT is appropriate for grade 1 through adult with an administration time of 45 minutes. Both versions of the TTCT may be scored locally by purchasing the suitable scoring guides and norms-technical manuals. For those who wish to send in the response booklets for scoring, the STS scorers are capable of scoring with a high degree of reliability. Computerized individual and group reporting which includes raw scores and national and local percentiles are part of the scoring service. Request a TTCT Preview Sample.